About 40 used bedbug bombs greeted Mike Deutsch when he entered a small home in Hempstead, N.Y., last year. "The first thing I thought was, 'Is everyone okay?'" recalled Deutsch, an entomologist with Arrow Exterminating. Fortunately, no one in the Hempstead house had been sickened by the chemicals enlisted in the family's do-it-yourself eradication attempt -- although new studies warn of the potential subtle or long-term consequences of exposures to bedbug pesticides, including hormone disruption, reproductive difficulties and behavioral problems. Everyone also escaped unscathed from a duplex in Marion, Ohio, that caught fire during a heat treatment for bedbugs in late December. Research by the Centers For Disease Control and Prevention suggests that people are not always so lucky. A pattern of desperate, dangerous and often futile measures have Deutsch and other bedbug experts warning the public that bedbugs pose more significant problems than just their notorious nocturnal nibbling. While the epidemic fills fewer headlines today than when it resurfaced in the mid-2000s, experts also recognize that the bedeviling pests only seem to be multiplying further. A report released by Penn Medicine on Thursday suggested that infestations in Philadelphia are growing by 70 percent a year. Nearly all pest management professionals, according to a nationwide survey published in April, reported servicing a bedbug infestation in the past year. The issue has also captured the attention of several local and national agencies, which are now drafting and enacting legislation to promote safe bedbug control. "People become desperate and will do crazy things," said Jody Gangloff-Kaufmann, a community-integrated pest management coordinator at Cornell University. "Overall, the public health effects of bedbugs have been largely overlooked." Beyond the toxic chemicals sometimes misused to fight them or the house fires that can result from other efforts, bedbugs are associated with a variety of health concerns. The pests can cause anxiety, depression and lost sleep for those who face an infestation and the social and financial hardships that can come with it, Gangloff-Kaufmann said. She added that sores from bedbug bites may even open up avenues for infections, such as from superbug methicillin-resistant Staphylococcus aureus, which commonly lives atop human skin. While the general consensus remains that bedbugs can't transmit disease, some scientists are unconvinced and underscore how relatively little is known about the insect. People will also put themselves in dangerous situations to avoid the possible presence of bedbugs. As temperatures plummeted across the Midwest late last week, two homeless men reportedly chose to sleep outside rather than go into a Chicago shelter that's been battling bedbugs. Kevin Govert, one of the men, told DNAinfo Chicago that he does not want to "get bedbugs again." No building is immune. Infestations over the last couple months were reported in libraries, classrooms, movie theaters, hospitals, jails and fire stations, among other locales across the country. "Bedbugs are not going to go away," said Dave Stone, director and principal investigator for the National Pesticide Information Center at Oregon State University. Rising resistance among bedbugs to the chemical arsenal that once helped keep them at bay is making matters worse. One consequence -- and even a potential contributor to the insects' resistance -- is the tendency among some people to use more of the chemicals, and more often, should an initial application fail to eliminate the bugs. In November 2012, the CDC -- using data from the National Pesticide Information Center -- issued a formal health advisory "alerting the public to an emerging national concern regarding misuse of pesticides to treat infestations of bed bugs and other insects indoors." Between 2006 and 2010, 129 mild and serious health effects, including one death, were reported from bedbug-related pesticide use, according to the centers. Stone said that while he doesn't have any updated numbers, the trend doesn't appear to have abated. "Sadly, pesticide misuse is going to be an issue that we need to be vigilant against all the time," he said. Stone relayed reports of people putting the chemicals on their skin or on mattresses contrary to the instructions on the product's label. Victims of an infestation have been known to spray a pesticide not approved for bedbugs or for indoor use -- or even one that is outright banned -- further raising the risks of ineffectiveness and toxic exposures. "The thought of an insect feeding on your blood -- it's psychologically traumatizing," said Stone. "It really makes people desperate, and they do resort sometimes to things that can harm their health." In a study published in November, Canadian researchers found that the urine of nearly every one of 779 children studied showed evidence of recent exposure to pyrethroids, a pesticide commonly used in households and the central ingredient in bedbug control products. They are also the same pesticides to which bedbugs are increasingly resistant. When researchers compared the children least and most exposed to pyrethroids, they found roughly a doubling in the odds of that child exhibiting behavioral problems, even after controlling for other factors, such as lead exposure and socio-economic status. "Since the whole bedbug epidemic started a few years ago, I'd been wondering if these chemicals had any kind of an effect," said Maryse Bouchard, an environmental health expert at the University of Montreal and co-author on the study. "But we know very little about the health effects of pyrethroids. It's been relatively recent that we've used begun to use them on such a large scale." Some even newer bedbug pesticides are emerging under the U.S. Environmental Protection Agency's expedited approval process, which the agency told The Huffington Post is part of its multi-pronged approach to combat the epidemic. Many of the new products combine different pesticides in an effort to outsmart the pyrethroid-resistant critters. More affordable over-the-counter products are still generally pyrethroid-based. "As long as labels are followed, there should be no concern about health risks," said Missy Henriksen, a spokeswoman with the National Pest Management Association, referencing all EPA-approved pesticides. But Ruth Kerzee, executive director of the Midwest Pesticide Action Center in Chicago, argues that even with the EPA's blessing, the jury remains out on the safety of the new pesticides, whether employed properly or not. Overall, the science on bedbug pesticides, she said, is minimal -- and so is the likelihood that a property owner will use a product precisely according to the label. "We may not know the health effects until decades later," she said. 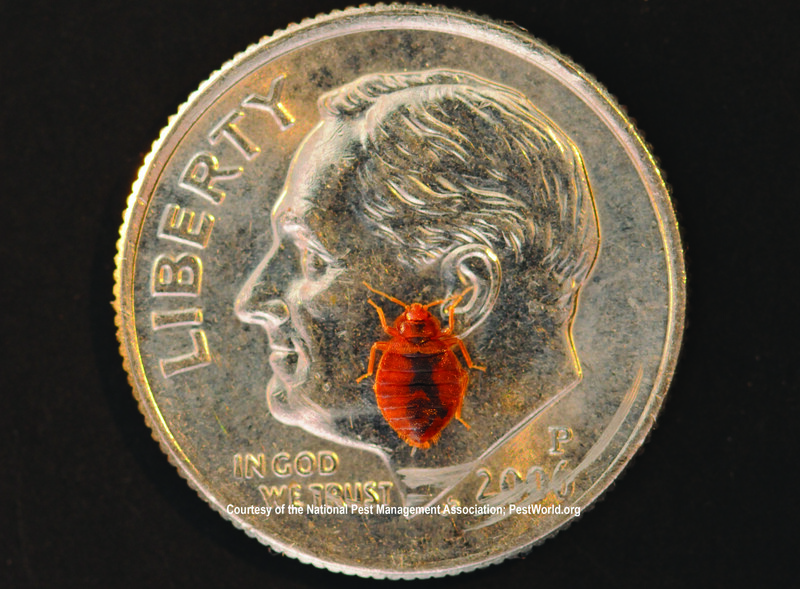 Kerzee noted that the burden of bedbugs is particularly heavy on poor people. Without thousands of dollars to pay for safe and effective strategies, such as hiring a professional to organize and heat-treat all of one's belongings, low-income families are left with few options. Gangloff-Kaufmann's program does offer a series of illustrated guides in both English and Spanish on affordable measures to prevent and manage bedbugs, such as removing clutter in which bedbugs love to hide and "making your bed an island." Moreover, shelters and subsidized housing for low-income families have been forced to close when building managers could not mitigate bedbugs properly. Cynthia Northington, program director at Chicago's Franciscan House and Annex, said she and her staff have been working hard to keep their 300-plus beds open (hers was the shelter passed up by the homeless men). Exterminators strip and spray all beds once a week -- a practice Kerzee discourages -- in addition to the shelter's other strategies, such as limiting guests to one bag and incrementally replacing mattresses and encasing new ones in bedbug covers. It's been a costly program, she said, and they've been actively seeking donations. "Right now we're in containment," said Northington. "But bedbugs multiply very rapidly, and before you know it, they could infest." Bug bombs or foggers can exacerbate an infestation by driving the bugs into different areas of a building, noted Henricksen of the pest control industry group. Bedbugs are so "cryptic and insidious" that they hide out in everything from TV sets to iPhones, added Deutsch of Arrow Exterminating. And while drops from a pesticide bomb may never even touch their shells, the chemicals could well penetrate human skin. "People unknowingly put themselves in harm's way trying to get rid of these blood-sucking pests," Deutsch said. "This needs to be taken seriously."